Toxins From Algae Increasingly Threaten City Water Supplies : Shots - Health News In Ohio, more than 100 people got sick in 2013 and 2014 when municipal drinking water was contaminated with toxins from algae blooms in Lake Erie. The CDC says these are the first known instances. A algae bloom in Lake Erie contaminated the water supply for Toledo, Ohio, in August 2014. About 400,000 people were without useable water. The city of Toledo and nearby communities have earned the dubious distinction of being the first to report outbreaks of human illness due to algae toxins in municipal drinking water, according to a report published Thursday by the Centers for Disease Control and Prevention. Both areas take their drinking water from Lake Erie. 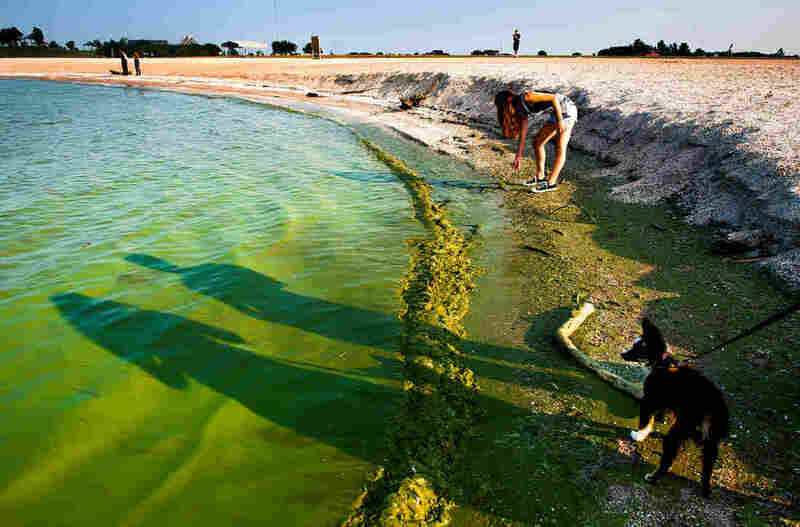 Blue-green algae are common there and in many other in freshwater lakes, where they can multiply in the heat of summer and produce toxins, according to the Environmental Protection Agency. Exposure to water contaminated by toxins can cause rashes, respiratory issues and stomach or liver illness, and are an ongoing issue in recreational areas around the country. Not to mention they can cause dead zones in bodies of water, killing marine life. And if you've ever seen one, they don't exactly make for a pleasant day at the beach. The bloom can look like chunks of green, earthy scum floating on the water, or make the water look like it's been dyed green. In September 2013, microcystin toxin was detected in the water treatment facility for Carroll Township, Ohio, at 3.5 times the safety threshold for drinking water. The township's 2,000 residents were told to use water only for dishes and "non-drinking uses." Six people suffered gastrointestinal illnesses in the outbreak, according to the CDC. Then in August 2014, the state of Ohio declared a state of emergency after algal toxin contaminated the city of Toledo's water supply. This time around, 110 people got sick, and almost half a million people had to quit drinking tap water until they got the all clear. Drawing water from the cold depths of a lake can reduce the risk of contamination, according to the EPA, and water treatment facilities can filter out or neutralize toxins. Among the biggest causes of algae blooms: an excess of nitrogen and phosphorus in warm, unmoving water. Those nutrients sneak into water predominantly through the use of fertilizer in agriculture. Warmer summers and higher rainfalls that cause sewer systems to overflow also help algae flourish. It's too early to know whether drinking water problems due to algae are becoming more common, says Jonathan Yoder, a CDC epidemiologist and one of the report's authors. "The bottom line is that we can't say whether they are increasing or not, we know that the conditions that lead to algal blooms — nutrient pollution and warm water — are present in these freshwater lakes," Yoder says. "I think there's a continual risk in some of these areas for algal blooms and for some of them to be the type that have toxins that cause human illness." Kathy Benedict, lead author of the paper and an epidemiologist with the CDC's Waterborne Disease Prevention Branch, points out that the cases in Ohio in 2013 and 2014 were not necessarily the first — they were just the first to be reported. The CDC is tracking harmful algal blooms through One Health Harmful Algal Bloom System (OHHABS) to help prevent illnesses, she says. Fortunately, health problems from drinking water remain rare in the U.S. The CDC report, which was published in Morbidity and Mortality Weekly Report, found than in 2013-2014, 42 outbreaks were reported in 19 states, resulting in 1,006 illnesses and 13 deaths. Most of the cases and all of the deaths were caused by Legionella, the source of Legionnaire's disease. For Lake Erie, blue-green algae blooms have become an "annual summer plague," in the words of Cleveland's newspaper, The Plain Dealer. And they've just had one of their worst years yet. In the summer of 2017, blooms in the great lake were the third-largest ever recorded. The good news is that this time around, no one got sick.